This week I want to share with you a chapter from my book. This chapter is the story of how I learned to better understand what I call “the paint can” — the many familiar and societal inputs that go into forming the childhood scenario that is the basis for what we believe to be real about ourselves, life and love. I hope you find it valuable. Big hugs of love, Jason. On November 3, 2010 The Wall Street Journal ran a story announcing my departure from Live Nation. It was a news story for about a day, then everyone went back to work. Life moved on, as it always does. I learned a lesson when I was in grade school. My school held a fundraiser, you know the way schools do: whichever class sold the most would get an ice cream party. I was determined that my class would win, so I rallied the troops and pushed all my classmates to sell, sell, sell. We won. On the day the party was scheduled, I woke up sick with a cold. My mom made me stay home. I was sure they would reschedule the ice cream party, positive that everyone would recognize my invaluable efforts and wait for me to return. Of course they didn’t. The party went on and I’m sure everyone enjoyed their ice cream just fine without me. I learned from the ice cream party that life goes on. Oh we can create drama and scandal and postpone the inevitable. But life always goes on. So on November 3, 2010 I turned off my phone and my computer and went home. The truth is there was no scandal. No drama to report. It was simply time. After a long and successful run, my career at Live Nation was over. I was exhausted. I’d lost my focus after my mom’s passing. The deadlines and drama just didn’t seem to matter as much any more. The truth is that not much in my life mattered at that point. Throw the horrible economy on top and it was a perfect storm. My division’s numbers were down and I didn’t have a solution. I was burned out and I needed to move on. Michael and I made a deal and, with tears in both our eyes, we hugged and I left. Only now there was no work to hide behind, no mask. Just me and nothing else. For awhile I settled into thoughts of who I used to be. But that was depressing. Next I kept myself busy thinking of all that I would be. Dreaming about doing this. Planning to do that. The truth, though, is that I was tired, exhausted. Contemplating all I would do someday only made it worse. I needed a simple answer, for myself and for the world. “What do I do?” I wanted an answer so opposite to anything I had ever said that it would shock me and everyone else into thinking a new way. Then one day, sitting on the beach staring at the waves, my answer popped its head out of the water―“I watch dolphins.” It was so perfect. Just what I was looking for. It would be my answer for the next two years. You should have seen the expression on people’s faces. Not sure if I was joking … or crazy. In all honesty, I was a little of both. But it didn’t matter. That silly little answer became my salvation as it forced me to find a new way to value myself. Having created some breathing room for myself, I got back to the business of figuring out who I was. I decided to start at the beginning, to journey back through time. So I picked up the phone and started calling my mom’s friends. I gave them all the same background. Mom is gone and I’m on a journey to figure out who I am. I wanted―no insisted―on their help. I wanted to piece together the first few years of my life, and I needed their help to tell me everything that had gone on with my mom during that time. How she felt. What she did. How my dad treated her. What friends she had. Everything. My mom became pregnant with me at age 20. She was so happy to be pregnant. She had always wanted to be a mom and now she was on her way. But she was also scared. All the fear and insecurity she had inherited from my grandma was bubbling out. As a result, she did what we all do when we don’t feel the way we think we’re supposed to: she felt guilty. But my mom knew feeling guilty wasn’t right either, so she layered on another level of guilt: feeling guilty for feeling guilty for being scared. My dad was no help at all. He brought his own issues and dramas to the relationship, adding stress and anger to my mom’s life. Apparently he yelled a lot. And broke things. My mom tried to keep the peace and held her feelings in. There were also money issues. To be exact, there was no money. This worried my mom more. How would they pay the bills? What would happen after I was born? She started worrying that maybe having a baby wasn’t the best idea. While all this was going on, I was forming inside her. My brain, like that can of white paint I talked about in Chapter 13, slowly became tinted with the colors of the emotions my mom was feeling. Drop by drop I was learning what the world was like: scary and lonely. A world without money and support. A place where it wasn’t okay to express your feelings. Instead you swallow them, keep the peace at all costs … and feel guilty. UGGGHHH. Crazy right? All that going on and I wasn’t even born yet. So there I was interviewing my mom’s friends, meeting with Vera, putting my life together bit by bit. Oh … and crying. In fact, I was getting so good at crying that once I even cried at an Adam Sandler movie! I now had a pretty good understanding of my life in the womb. What my mom was up to. What feelings and beliefs she was feeling and transmitting to me. This had given me a good grip on my primary scenario and the early formation of my brain. Now I needed to get to know little me. What was I like as a child? What was going on in my world? Once again I turned to my mom’s friends. They weren’t sick of me yet so I kept on pumping them for information. Like a reporter desperate to get his scoop, I pushed and pried to get a glimpse of my early life. They described me as “a little man in a boy’s body.” Always older than my age. Always helping my mom. Solving problems for myself. A perfect little child. Like an angel … okay, okay, that’s enough. But seriously, it was as though I had been born knowing my mom needed stability and maturity and that’s what I provided. Every once in awhile one of Mom’s friends would get to talking and would give me a little too much information. I remember one conversation with …well, I’ll call her Martha to protect her reputation. I was talking to Martha and she was sharing this and that about my mom. She told me what a great friend my mom was. How they had shared secrets. Intimate secrets. Like the time Martha slept with two different men in the same week. AHHHHHHHH! EAR MUFFS, EAR MUFFS. WAY too much information! I took that as I sign I had learned all I would from my mom’s friends, so I started reading, just as I had all those years ago to learn business. I read … and read … and read. My ongoing mission was to further understand what made me tick. In books like A General Theory of Love, The Drama of the Gifted Child, and Biology of Belief I found the answers I was looking for, rounding out what I was learning with Vera with additional nuggets that I applied in order to understand how I came to be. While I was in the womb I’d learned about this scary place. My world. I’d learned about feeling alone and guilty. I’d learned that my dad couldn’t be trusted, and that money was something that made my mommy feel scared inside. All of this mixed together in the paint can of my ever- expanding brain. Then I was born. December 22, 1972. I and my already-tinted-paint- can brain popped into this world. I immediately began to observe the world and absorb everything. This is what we do for the first few years. Observe and absorb. It’s how we learn so much so fast. Our brains are like a never-ending supply of Bounty paper towels picking up everything thrown our way. We are driven by an untamed curiosity. We drink in the world exactly as we see it. The confusing part is that we aren’t seeing it with fresh eyes. We’re seeing it through the filter of all we learned in the womb. We are seeing the world from the same perspective as our moms because our paint is the same color. The little Jason my mom’s friends described to me wasn’t a coincidence. I was mature and helpful and good because all of my programming told me if I was good, I would be loved. I was forming exactly as I had been taught to get the affection all little children desire. The final piece is DNA. Carried forward in all human DNA, mine and yours, is a strong will to survive. That’s good right? Well, yes. But it also comes with an interesting twist. What exactly does survive mean? What was my DNA telling me I needed to do to survive? It was telling me to make the right decision. Why? Because historically a wrong decision meant I would end up being eaten by a saber-toothed tiger, or freezing in the snow, or eating a poisonous berry. So to keep myself safe … to keep all of us safe … my DNA was instructing my brain to see the world in a way that made it right. “But what is right?” The only version of right we know is the “right” of the tinted paint in our paint can. It’s the story of the world taught to us subconsciously by our parents, in my case the family story passed down from Grandma June, to my mom, and now to me. Do you see where this is all going? The little me, Toddler Jason, was armed with a brain that believed the world was scary and lonely. That daddy was mean. That money caused pain. That I was all alone. PLUS genetic programming that required my brain to be right, to make those beliefs a reality. So who was I destined to become? What was my life story guaranteed to be unless I made some dramatic changes? Exactly what it was for my grandma. Identical to the world of my mom. And exactly what I had been living for the first 37 years of my life. Scared. Alone. Never feeling good enough. If you need any more evidence of the strength of this family programming, consider this. When my grandma’s mom died and her dad left them to sit on that bar stool, she was left alone to take care of her two brothers. Years later my mom would be divorced and left alone to raise her two children. My uncle (my mom’s brother) would die in a motorcycle accident, leaving his wife alone with two children. I would later be divorced and left alone with two children. And my sister? You guessed it: divorced and alone with two children. I didn’t know whether to cry, barf, or jump for joy at what I was learning. Yeah Jason, but you made a lot of money. That was different, wasn’t it? It was different in that I made more money than my mom. Still, our perception of money was the same. She didn’t have it and was scared. I had it and was scared. She always felt she needed more. So did I. We were just living two different sides of the same coin. In all the important, internal ways, I was just like my mother. I had my DNA telling me to be right, my family story screaming inside telling me to work hard and that I wasn’t good enough. While everyone saw a superstar when they looked at me, inside I was a ticking time bomb. Just like my mom, I was trapped in a vicious cycle. Overworked, feeling under-appreciated, resentful, yet all the while secretly craving the dysfunction that was pulsing inside me. So I created it over and over again. Relationship after relationship. Job after job. Futile conversation after futile conversation with the voices in my head. It was July 18, two years to the day after the passing of my mom. I was living on the beach in a small community south of the Los Angeles airport. My daily practice was to walk on the beach. I would get going, soaking up the Southern California sun, and sometimes walk for hours. Some days it was meditative with my mind a gentle calm; on other days my brain whirled like a hamster on a wheel. Today I was melancholy, which is hard to explain to those who haven’t lost their parents. Psychologists have a name for it (of course they do). They call it “Adult Orphan Syndrome,” and given what I knew about my family history, this label made sense to me. Like most labels, this one also tells a story of its own. It diagnoses the feeling but also carries with it the baggage of what that label means in the world. The way grape juice quenches your thirst but leaves your teeth purple, so it was for me. My sadness became loneliness and then, as I settled into being an adult orphan, abandonment. As I walked I looked at my feet. Head down, feeling really sorry for myself. Remembering my mom. Missing her hugs. Reflecting on the awful disease that took her. Her strained last breaths. The horrible rattling in her chest. Lying on the bed holding her lifeless body. Then the tears started to flow. Really flow. I was sobbing when I became distracted by my feet. Step after step, I looked down at the footprints, like a trail of sad memories as I walked along. I remembered that poem, “Footprints in the Sand,” by Mary Stevenson. You know the one. A person has a dream of reviewing their life with God. They look at their journey and see there were often two sets of footprints, their own and those of God, who had been walking alongside them. But in the really tough moments, there was only one set of footprints. God is asked why he would leave them all alone in their times of greatest need. My mom loved that poem. It was a fixture in our home, traveling with us from the old pink trailer in Arizona to our many apartments and homes in California. 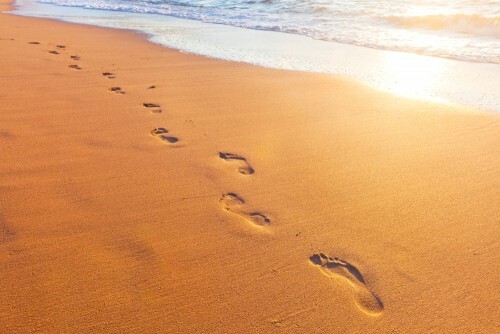 From relationship to relationship and job to job, “Footprints” was always there. At times it was a cut-out paper version, others a wood carving. There was even a laminated hand-written one my sister or I had given my mom. Thinking of the poem, remembering my mom, I plodded along all by myself, an empty beach and an empty man. Then I had a calling. Not a voice, but a “knowing” that I should look to the sea. So I did. There, swimming in perfect rhythm with my steps, was a lone dolphin, gently gracing the water, dipping in and out of the waves as dolphins do. Dolphins were my mom’s favorite animal; she had them everywhere. Dolphin calendars, dolphin souvenirs given to her by the children she looked after. A dolphin was the gift guaranteed to bring a smile to my mom’s face. Dolphins filled her home. I walked for a mile with that dolphin. It never sped up or changed direction, nor did I. We just meandered along, the dolphin, my mom, and I. Then it hit me, and I smiled the warm smile of a comforted child. I wasn’t alone. I just needed to look up from my walk and notice who was with me. Truly you have been blessed with a unique talent that is ,”to accept the environment of giving your heart your love to others in such an effective manner and at a time that it is so needed by so many.” Thank you but more important is the bond of support and encouragement that your family gives you.” For without them and their love and hearts where would you be. I have to admit that the paint can took me a while to get. At first I thought, how could I be carrying all those things from when I was a child into my adult life and have them influence me? But the more I looked, the more I could see. So much I closed myself off from, narrowing my vision. When I took the time to look around at what was happening and why I was reacting to certain situations, this chapter suddenly started to make so much more sense. Many of the programing ingrained in me was indeed worries and stresses carried over from the time I was young, reinforced throughout my life. Learning to take a step back, to see not with all the colours of my can of spray paint, but with a blank and clean slate has been so helpful to me. I have let go of so much worry and stress and grounded myself in the moment, and learned to appreciate and cherish it for what it is, without having it clouded over. I absolutely agree with you and Kathleen….it’s something that I’m noticing more and more these days…….